With an aging population and rising healthcare costs, the need for organs, tissues and personalized strategies in medicine has never been greater. Recent developments in medical technologies such as 3D-bioprinting, stem cell therapy and gene editing hold the promise to provide tissues for transplantation, tailor-made medical solutions and opportunities to help the body repair and regenerate itself. However, our understanding of the fundamentals of cell, tissue and organ regeneration and their potential application for therapeutic purposes are still in its infancy. For Regenerative Medicine to fully capture its potential, a synergistic and multidisciplinary effort remains necessary to achieve essential scientific breakthroughs. Together the University Medical Center Utrecht (coordinator) and the Utrecht University offer a unique international PhD programme, named RESCUE, for excellent PhD candidates (early stage researchers, ESRs) with 29 high level fellowships for a joint doctorate programme within the Regenerative Medicine Centre Utrecht. The RESCUE programme aims to enhance the potential and future career perspectives of researchers by providing a global training network including over 50 excellent academic and industrial partner organisations, creating a new generation of research experts, empowering them to take leading positions in the field of Regenerative Medicine world-wide. PhD positions are for Master's students who have not worked in The Netherlands for more than 12 months in the last 3 years. Positions are available in the fields of: stem cells & organoids, cardiovascular regeneration and musculoskeletal regeneration. The Coffer Lab also has a joint position available. More information and the application procedure can be found here www.rescue-cofund.eu. Treatment with lysine deacetylase inhibitors (KDACi) for haematological malignancies, is accompanied by haematological side effects including thrombocytopenia, suggesting that modulation of protein acetylation affects normal myeloid development, and specifically megakaryocyte development. However, the effects of KDACi inhibitors on human hematopoiesis have not been systematically investigated. In this study by Marije Bartels and Anita Govers, utilising ex-vivo differentiation of human haematopoietic progenitor cells, we investigated the effects of two functionally distinct KDACi, valproic acid (VPA), and nicotinamide (NAM), on megakaryocyte differentiation, and lineage choice decisions. While both being KDACi, VPA and NAM can differentially regulate cell fate decisions during megakaryocyte, and erythroid (ME) development through specific effects on promoter-acetylation of genes regulating ME-lineage development. Here, we compared the effects of VPA treatment with NAM treatment on human ME-lineage development, and further progression into the megakaryocytic lineage. Our data demonstrate for the first time that KDAC and SIRT inhibition differentially modulates the expansion and differentiation of ME-progenitors (MEP). Utilising a histone 3 lysine 27 acetylation (H3K27ac) chromatin immunoprecipitation- (ChIP) sequencing approach, we identified key regulatory genes implicated in myeloid progenitor function, and ME-lineage differentiation, directly regulated by VPA and NAM treatment. These findings increase our understanding of the effects of KDACi on normal haematopoiesis which should be considered when using KDACi in a clinical context. This work has recently been accepted for publication in PLoS ONE. 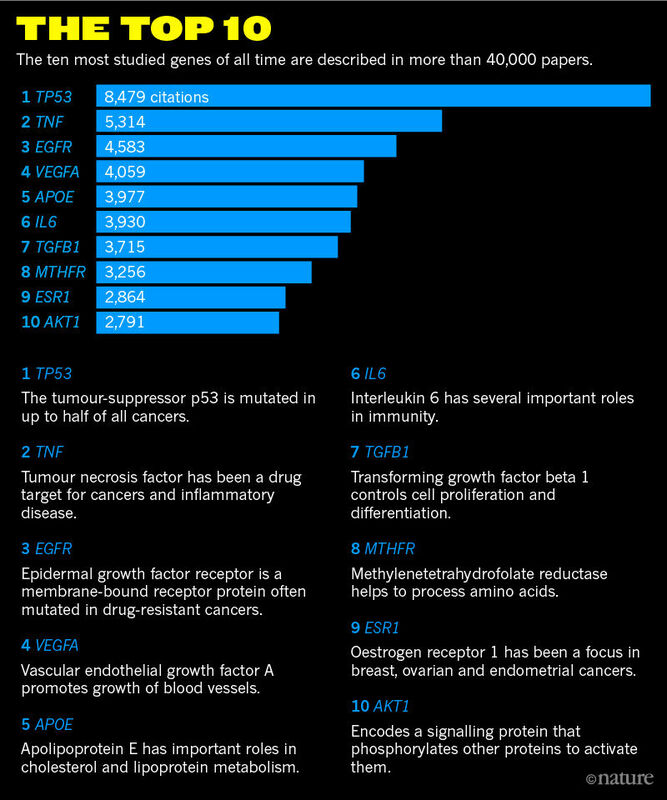 A recent study by postdoc Peter Kerpedjiev and highlighted in Nature has reported a list of the ten most studied genes of all time — a sort of ‘top hits’ of the human genome, and several other genomes besides. This sheds light on important trends in biomedical research, revealing how concerns over specific diseases or public-health issues have shifted research priorities towards underlying genes. It also shows how just a few genes, many of which span disciplines and disease areas, have dominated research. Creeping in at number 10 is Protein Kinase B (AKT) which, together with Brian Hemmings and Philip Tsichlis, we were the first to identify (Coffer & Woodgett, 1992). Subsequently, together with Boudewijn Burgering, we were able to demonstrate that PKB/AKT was the missing link downstream of PI3K transducing a plethora of extracellular stimuli to intracellular signaling events (Burgering & Coffer, 1995). Great to see how much research has gone into understanding PKB/AKT biology over the last 20 years, with more than 350 clinical trials exploiting these findings. If you would like to learn more then take a look at the recent excellent review from Brendan Manning and Alex Toker (Manning & Toker, 2017). Congratulations Dr Desiree Haaften-Visser: PhD Survivor ! Congratulations to Dr. Desiree Haaften-Visser who has successfully defended her PhD thesis entitled: Identification and characterisation of genes associated with congenital intestinal disease. A proper function of the intestine is essential for normal growth and function of the human body. Disturbance of this function can lead to severe illness, both due to local disease and malnutrition. Treatment can be challenging, since current therapies are often unable to offer a cure, but at best ameliorate symptoms. To improve the therapy of diseases of the gastrointestinal tract a better understanding of the pathogenesis of these disorders is essential. During her PhD research, Desiree has focussed on understanding the pathogenesis of a few rare hereditary intestinal diseases through the use of molecular genetic methods, including next-generation sequencing, followed by in vitro functional assays. This approach of ‘functional genomics’ has the ultimate goal to improve the therapy of these diseases. Here, for the first time, association of mutations in ANKZF1 with infantile-onset IBD has been described. ANKZF1 is an essential protein in the mitochondrial response to cellular stress and ANKZF1 deficiency leads to mitochondrial dysfunction. In a second study, mutations in STX3 leading to disturbed enterocyte polarity, were found to be a novel cause of microvillus inclusion disease. Additionally, a novel mutation in DGAT1 was found as a cause of severe congenital fat intolerance. Finally, a novel whole-exome sequencing (WES) diagnostic approach was developed for congenital intestinal diseases. Taken together, this work contributes to the unravelling of the pathogenesis of rare congenital intestinal diseases, which is crucial to develop novel treatment options for these patients. This work was a collaboration between the Coffer Lab, Prof. Roderick Houwen and Dr. Sabine Middendorp at the Regenerative Medicine Center and Wilhelmina Children's Hospital, University Medical Center Utrecht. The process of cancer metastasis is a complex one and involves multiple steps. It involves cancer cells leaving the primary tumor and moving into the blood vascular system (intravasation), traveling to a distant site in the body, often the lungs, bone or brain. Here the tumor cells need to move out of the blood vessels (extravasation) and then settle and grow into a secondary tumor (metastasis). Until now it has been very difficult to study these aspects of cancer biology in the lab, and almost all studies tend to use animal models. However, with recent developments in tumor-organoid culture and vascularization, together with microfluidic technologies, the possibility to develop in vitro systems for studying metastasis is becoming a possibility. At Utrecht University, the Animal Welfare Body awards research grants for projects aim at reducing the use of animal experiments. Guy Roukens, senior postdoc in the Coffer Lab, has been awarded such funding to explore the possibility of developing in vitro microfluidic systems that can be used to investigate tumor vascularization, intravasation and extravasation and thereby help understand the process of tumor metastasis. Osteoarthritis (OA) is a rheumatic disease leading to chronic pain and disability with no effective treatment available. Recently, allogeneic human mesenchymal stem cells (MSC) entered clinical trials as a novel therapy for OA. Increasing evidence suggests that therapeutic efficacy of MSC depends on paracrine signaling. Here we investigated the role of extracellular vesicles (EVs) secreted by human bone marrow-derived MSC (BMMSC) in human OA cartilage repair. We show that BMMSC-EVs inhibit the adverse effects of inflammatory mediators on cartilage homeostasis. BMMSC-EVs also promoted cartilage regeneration in vitro. Addition of BMMSC-EVs to cultures of chondrocytes isolated from OA patients stimulated production of proteoglycans and type II collagen by these cells. These data demonstrate that BMMSC-EVs can be important mediators of cartilage repair and hold great promise as a novel therapeutic for cartilage regeneration and osteoarthritis. This work by Magdalena Lorenowicz is part of a combined research program with the Saris-Vonk Lab and has been accepted for publication in Thernostics. 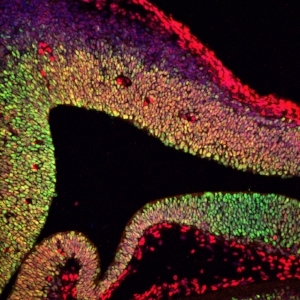 Mutations in Foxp1 have been linked to neurodevelopmental disorders including intellectual disability and autism, however, the underlying molecular mechanisms remain ill-defined. Here work from Luca Braciolli demonstrates utilizing RNA- and chromatin immunoprecipitation (ChIP)-sequencing that Foxp1 directly regulates genes controlling neurogenesis. We show that Foxp1 is expressed in embryonic neural stem cells (NSCs) and modulation of Foxp1 expression impacts both neuron and astrocyte differentiation. Using a murine model of cortical development, Foxp1-knockdown in utero was found to reduce NSC differentiation and migration during corticogenesis. Furthermore, transplantation of Foxp1-knockdown NSCs in neonatal mice after hypoxia-ischemia (HI) challenge demonstrated that Foxp1 is also required for neuronal differentiation and functionality in vivo. Foxp1 was found to repress the expression of Notch pathway genes including the Notch-ligand Jagged1, resulting in inhibition of Notch signaling. Finally, blockade of Jagged1 in Foxp1-knockdown NSCs rescued neuronal differentiation in vitro. Together these data support a novel role for Foxp1 in regulating embryonic NSC differentiation by modulating Notch signaling. This work is part of a collaboration with the Nijboer and Pasterkamp Labs and the full publication in Stem Cell Reports can be read here.